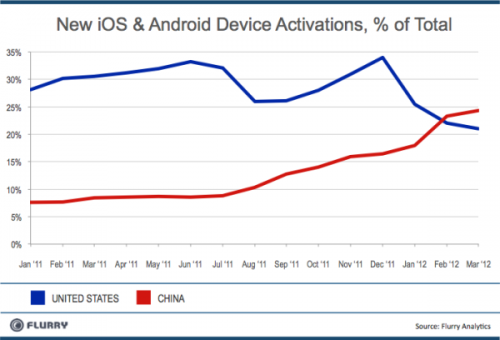 Mobile analytics company Flurry reports that activation of new iOS and Android devices in China has surpassed the U.S. for the first time. February, Flurry calculated that China surpassed the United States in monthly new iOS and Android device activations for the first time in history. China is now the world’s fastest growing smart device market. While the data shows combined iOS and Android data, it reflects the same audience of smartphone buyers. Apple has been making efforts to expand their presence in China. They even included a number of China-specific features in their upcoming Mountain Lion release. In addition, reflective of the increase in activations, China was also the fastest growing country in app usage as measured by app session growth. Keep in mind how many people live in china. This isn't too surprising. 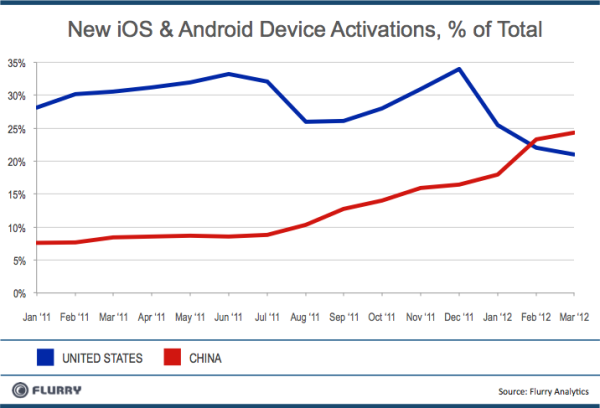 IDC had predicted China would become the largest smartphone market in 2012. I guess this is just the sign that it really is 2012 already. That said, we'll be seeing lots of this over the coming years (i.e. China becoming the world's largest market for "X"). It will be a sea change after 70 years of American consumer dominance, but it doesn't have to mean the end of American influence. That's like saying new York city has more smartphones than backwoods west Virginia. In order to have sales you need consumers. An enormous population that is offered the same product as a smaller population will have higher sales...... Duh? They have more than 4 times the population. It isn't a huge surprise, especially with deals with ios devices with carriers and the government have been going through recently aswell. It took me a long time to learn english. I'm not going to learn chinese, too! I wouldn't say too much, your location indicates that you are in a country that invaded most of Europe, Russia and Africa and then lost it all again within 6 years! Along with China-specific features in their upcoming Mountain Lion release, Siri will also support Chinese Mandarin. Tim Cook has said China is their #1 focus for developing markets.